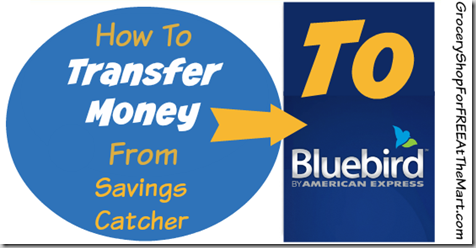 February 28th has passed and we can no longer double our Savings Catcher money by transferring them to Bluebird. Bummer! But, what wasn’t expected is the button to transfer money to Bluebird was totally gone. Unfortunately, this is no longer an option, at all. Well, guess what. We can! Now, the money won’t double but if you would like to continue to transfer your Savings Catcher rebates to your Bluebird card, there is a way. All you have to do is go to the website savingscatcher.walmart.com, not the smartphone app. After you log in, you will see this option about halfway down the page. Either click the “Redeem to Bluebird” button or you may need to edit your redemption method if you’ve never transferred to Bluebird before. Why would someone make these transfers even though they won’t double anymore? Because it is still easier to pay with a credit card at the register than to print out your eGiftcard or bring it up on your phone for the cashier to scan. I have tried all weekend long to transfer my Walmart Saving’s catchers balance to my Bluebird American Express card, but always get an error message and it does not go through. I’m not sure why, I just sis it a few weeks ago without an issue. Perhaps try the AmEx helpline at Bluebird.com? I have had by bluebird card for years and am also having trouble transferring my savings. Have contacted Walmart several times. No answer. I guess all bluebird cards are having trouble. I can’t. It sounds like you need to contact Bluebird technical support. Although, you might be confusing the amounts. The Savings Catcher dollars are kept in an entirely different “bucket” of dollars than anything else you have on the card and can only be spent at Walmart.